Julian Assange told Sir David Frost that he believes the torturous conditions of Bradley Manning’s imprisonment at U.S. Marine Base Quantico are designed to coerce Manning into testifying against him. There is pressure that’s been applied to one of our alleged sources, Bradley Manning in his prison cell. He is a young intelligence analyst being held in Quantico, Virginia, for some six months now, prior to trial, and there is pressure on him through his physical cell conditions, according to his lawyer David Coombs, to coerce him into testifying against me, or against the organization, to try and suggest that there is some kind of a conspiracy to commit espionage. Which there is not. This statement was likely alluding to his previous statements, in which Assange said he is unaware who may be the leaker behind the U.S. military footage, published by WikiLeaks as “Collateral Murder,” among other documents the organization has published to date. To Assange, however, the motives for Manning’s treatment, and for targeting WikiLeaks and himself, are clear. The State Department and U.S. military have been tremendously embarrassed by the abuses that have been revealed. Well, what do you do when you are embarrassed? You want to save face. How do you save face? You have to slap the face of the person who is perceived to have embarrassed you. Lieutenant Colonel David Coombs, counsel for Bradley Manning, continues to fight for better pre-trial confinement conditions for his client, conditions that appear to be in gross violation of Article 13 of the Uniform Code of Military Justice. Coombs works through military channels, which include the supervisory staff of the Quantico confinement facility and the local Army Staff Judge Advocate’s (SJA) Office, to press for better treatment for Manning, who currently is under 24-hour surveillance. Coombs has stated that he will file a defense motion for Article 13, but cannot do so until Manning’s case is referred to a court-martial. Yesterday Coombs explained that the best chance a soldier in pre-trial confinement has to address harsh conditions is to appeal to the confinement facility, the base chain of command, and the SJA office. You can make a difference. We urge you to take action now to improve the brutal conditions of Bradley Manning’s treatment by insisting his human rights be respected while he remains in custody. Additionally, the Network encourages supporters to phone COL Choike at +1-703-784-2707 or write to him at 3250 Catlin Avenue, Quantico, VA 22134, to demand that Bradley Manning’s human rights be respected while he remains in custody. Speak Out Against the Inhumane Imprisonment of Bradley Manning! Please take action TODAY to speak out against the intolerable conditions of Brad’s imprisonment. A press release we sent out today detailing some of those conditions and pointing to other reporting on the topic follows. Quantico, VA, December 22, 2010 – After trying other avenues of recourse, the Bradley Manning Support Network is urging supporters to engage in direct protest in order to halt the punitive conditions of the soldier’s detention. Bradley Manning, 23, has been held in solitary confinement in military jails since his arrest in late May on allegations that he passed classified material to WikiLeaks.. 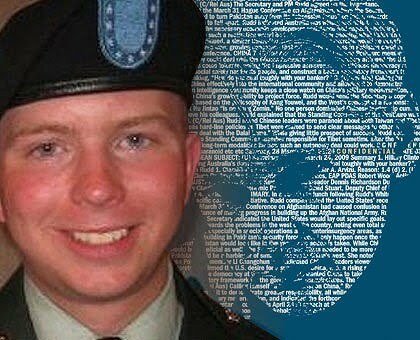 In the wake of an investigative report last week by Glenn Greenwald of Salon.com giving evidence that Manning was subject to “detention conditions likely to create long-term psychological injuries”, Manning’s attorney, David Coombs, published an article at his website on Saturday entitled “A Typical Day for PFC Bradley Manning”. Coombs details the maximum custody conditions that Manning is subject to at the Quantico Confinement Facility and highlights an additional set of restrictions imposed upon him under a Prevention of Injury (POI) watch order. Usually enforced only through a detainee’s first week at a confinement facility, the standing POI order has severely limited Manning’s access to exercise, daylight and human contact for the past five months, despite calls from military psychologists to lift the order and the extra restrictions imposed. The Bradley Manning Support Network calls upon Quantico base commander COL Daniel Choike and brig commanding officer CWO4 James Averhart to put an end to these inhumane, degrading conditions. Additionally, the Network encourages supporters to phone COL Choike at +1-703-784-2707 or write to him at 3250 Catlin Avenue, Quantico, VA 22134, and to fax CWO4 Averhart at +1-703-784-4242 or write to him at 3247 Elrod Avenue, Quantico, VA 22134, to demand that Bradley Manning’s human rights be respected while he remains in custody.